Test of the West Indies’ ill-fated tour of England but says a meeting with the West Indies Cricket Board (WICB) slated for Sunday will take priority. The former Windies captain will sit down with WICB officials, Antigua’s Prime Minister Baldwin Spencer and St. Vincent Prime Minister Ralph Gonsalves in St. Vincent to discuss “residual matters”, relating to the solution that was brokered last month which paved the way for the Jamaican’s return to the team. At the same time, speculation has been rife that Gayle could fly out to join the struggling side that has lost both Tests of the series and is currently in disarray, especially with a novice top order. “I don’t know if I’ll eventually get that call (from the selectors) but I have to meet with the board first on the third (of June) and the Test match starts on the seventh, so I don’t how that would work,” Gayle said on the SportsMax Zone, Tuesday. Gayle had indicated his unavailability for the Test phase of the England tour, preferring to play the full Indian Premier League (IPL) for Royal Challengers Bangalore. However, his IPL campaign ended early after Royal Challengers failed to reach the playoffs, and it sparked fresh discussion over his involvement in the ongoing Test series. While the agenda for Sunday’s meeting has not been disclosed, among the “residual matters” is expected to be Gayle’s role in a multi-million dollar West Indies Players Association lawsuit against the WICB, relating to the issuing of No Objection Certificates. In correspondence to Gayle last month, the WICB raised concerns about the lawsuit and Gayle’s continued participation in the litigation process, especially since he was making himself available for selection. 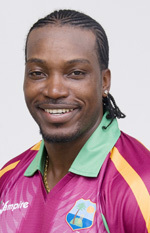 At the time, Gayle said he could not “possibly contemplate withdrawing unilaterally from proceedings”, contending that such a move would affect all West Indies players. The left-handed opener said the meeting with the board was critical in moving forward with his international career. “It’s nothing really to do with the cricket, to be honest with you,” Gayle said of the meeting. “It’s other issues to actually deal with at this particular time which the board needs to iron out. We’ll see how best we can work that out and see what comes out of it,” he said. Gayle is the region’s most experienced opener with 6,373 runs from 91 Tests at an average of 41. He is one of only four players in Test history with two triple centuries.